Our goal is to sell your home. The focus of Intercoastal Realty’s marketing is to maximize the exposure of your home to the market. This exposure includes traditional marketing efforts i.e., yard signs, professional photography, property brochures, local, regional and national advertising. This exposure is also digital, with instant marketing exposure throughout the world. Our first efforts are to educate and introduce your home to our Intercoastal Realty family of real estate professionals. Next we introduce your home to the local community of Realtors. One of Intercoastal Realty’s strengths is that we work with everyone to sell your home. 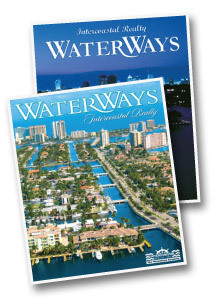 Intercoastal Realty publishes Waterways Magazine. This coffee table quality publication is direct mailed throughout Fort Lauderdale, and to select neighborhoods and homeowners in Miami, Miami Beach, Coral Gables, north and west Broward County, Boca Raton and Palm Beach. It is also direct mailed to over 1,000 luxury real estate brokers throughout the United States. Our digital edition goes to thousands more and is linked to our websites of our partners throughout the world. Intercoastal Realty was one of the first real estate companies to develop a website and utilize the world wide web. This continuous history is one of the main factors in the algorithms utilized by major search engines like Google and Yahoo. Intercoastal Realty’s website showcases your home in a way not available to companies using “template” websites. For more than 20 years Intercoastal Realty has had a booth at the Fort Lauderdale International Boat Show where we can represent your home. NEXT: Location is your best tool—and we’re strategically located for success!